Who is a bigger creep? With the arrest of longtime political advisor Roger Stone seems to be the beginning of the end of Trump’s streak of dodging the bullet. 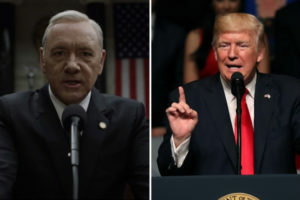 Like the lead character, Frank Underwood from the Netflix show, ‘House of Cards’, the lies and the treachery will catch up with you in the end. Unlike Frank Underwood, Trump is a novice politician. The political move that Speaker of the House Nancy Pelosi pulled on Trump would not have happened to Underwood. He would have been steps ahead of Pelosi. Pelosi, the daughter of a man who once was the Mayor of Baltimore has politics in her blood and knew how to navigate the totalitarian tactics that Trump was trying to pull. Every time Trump would try to basically dare Pelosi, especially when it came to the State of the Union address, she would call his bluff. Trump was quickly reminded that Pelosi was not one of his Trump Organization minions. After 34 days of a partial government shutdown, Trump threw in the towel and realized he had been defeated by a woman, a gender that Trump has little or no respect for. He also didn’t get his wall either. These 34 days proved that Trump’s inexperience is his downfall. With Trump tweeting that Stone didn’t even work for him and then Stone saying that he will cooperate with Special Prosecutor Mueller, Trump’s future is looking bleak. Isn’t that a wonderful thing for the American people!